The subject of today’s post was a difficult decision: a toss up between veg, gardens, landscape, last week’s show or this plant. In the end the plant itself made the decision because it has been in such a hurry to bloom (as will become obvious below). It seemed wrong to keep it waiting any longer than necessary. 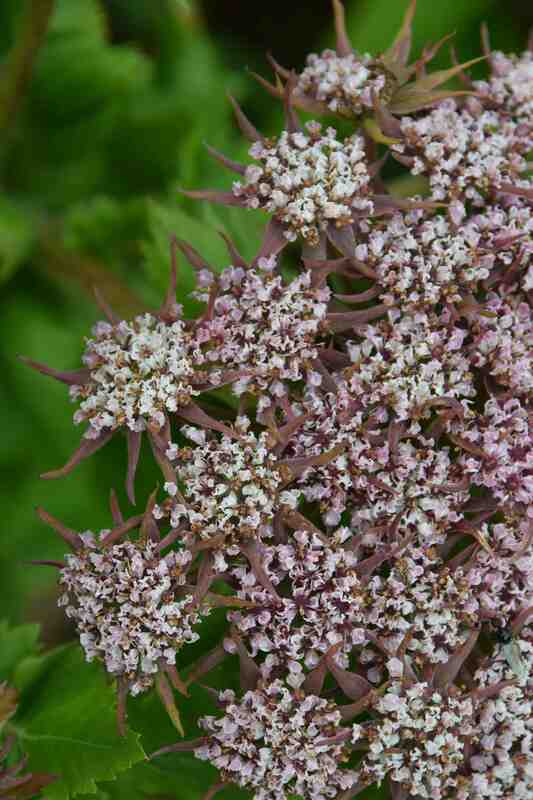 So, today is is the Madeiran parsnip or black parsley, an unusual and beautiful member of the Apiaceae (formerly Umbelliferae). My plants come from seed from a plant at The Bay Garden in Camolin, Wexford which bloomed in 2013 and I obtained some seeds in autumn (with permission) and sowed them in early spring 2014. I was not sure if the seeds needed stratification or not, though Madeira is not a cold place, even in winter, so I sowed two trays and one was left outside for a month and the other left in the cold greenhouse before they were both put in a propagator at about 20c in January. After a few weeks both batches started germinating and more seedlings kept coming up for several months. Germination was definitely erratic but it presented no problems at all. So I can confirm that this is an easy plant to grow from fresh seed – maybe the word fresh is important as it is with so many umbellifers. The Madeiran parsnip is Melanoselinum decipiens and is found on Madeira (no surprise there) in semi shaded places, in and around laurel forests. Breaking down the name, melano means black and selinum is the Greek name for parsley, and is a genus in its own right. 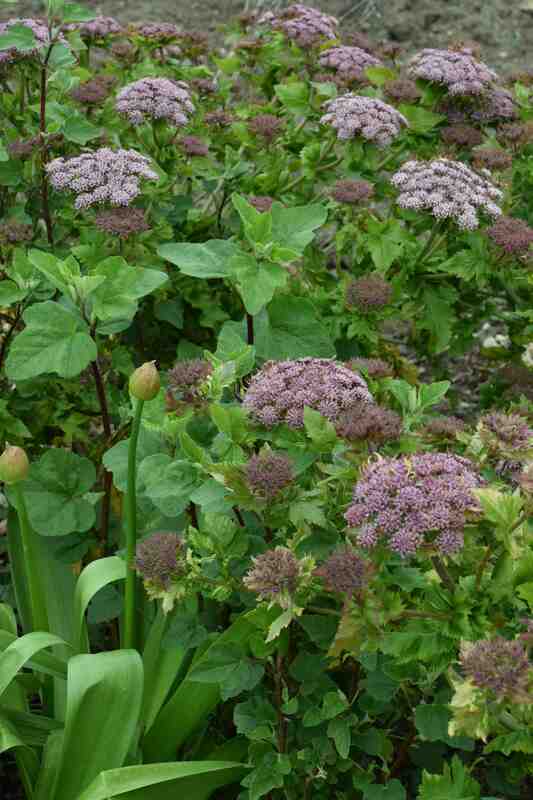 This ‘black parsley’ is named for the colour of the seeds, not the leaves or flowers. Like so many plants on the Atlantic Islands this plant exhibits gigantism* and is among the biggest umbellifers. It is also monocarpic, like many other plants in these habitats and after taking several years to reach flowering size the plants erupt in a fountain of bloom, set seeds and then die of exhaustion. These plants are hardly debauched teenagers but some gardeners disapprove of such a lifestyle. The thought of waiting years for flowers and then the plants dying is too different to the norm. Well I know it is an effort but then nothing that doesn’t take effort is worth having or is appreciated. So, how long do you have to wait? Well, in theory, according to some sources, it can take up to fifteen years and the plants can reach 3m high. The plants slowly build in height with thick, green stems marked with the scars of the fallen leaves. This is an evergreen plant and the leaves, each divided into feather-like segments (pinnate) are rich green and up to 1m long. The leaves are tinged with burgundy when young so this is a pretty impressive and handsome foliage plant all the time it is building up the momentum to bloom. You may have noticed that these photos are of flowers, and yet I only sowed the seeds in late 2013? Well I can happily report that you don’t have to wait ten years of more for flowers. All the plants put in a sunny bed have decided to bloom this year, just a year after germinating, acting as biennials. I was upset at first because the plants are small and young and lack a bit of the wow factor they should have. But they are attractive enough even though only 1m high and the good news is that there are quite a few seedlings in cell trays (though they are a bit stunted because I did not have places for them to be planted out) that should give me the chance of seeing flowers next year. even though not quite full size, each of my plants is producing quite a show. 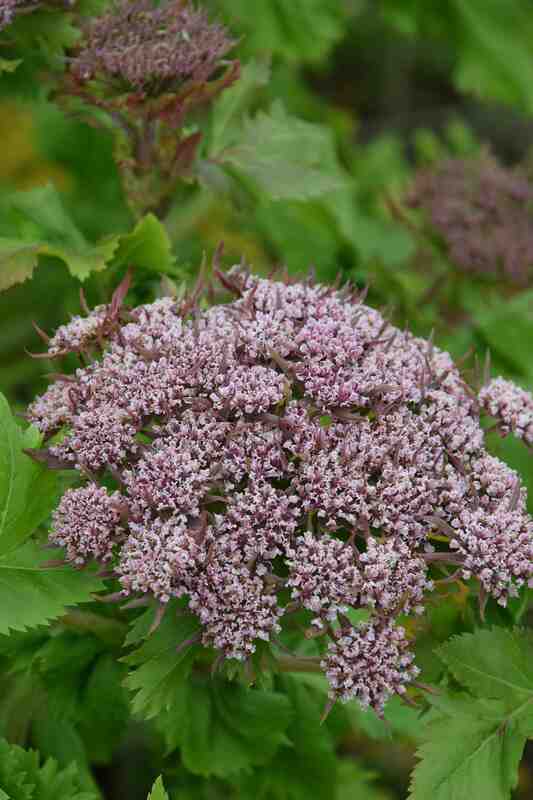 Each one has branched to make a mass of flowers almost 1m across, each with hundreds of umbels, each composed of thousands of tiny blooms that open rich pink. 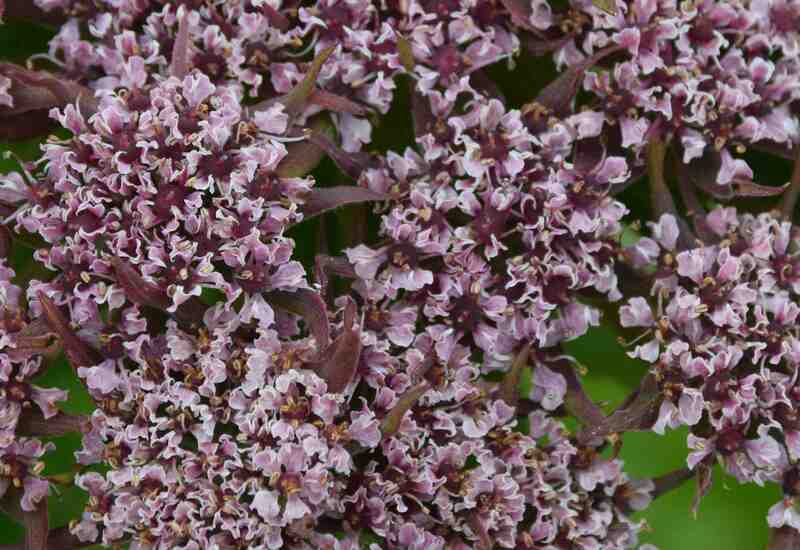 Most of the big umbellifers have stage presence because of their structure in the border but melanoselinum has something more. Instead of the very common white flowers in the family, these flowers, though tiny, are actually a rich pink and surprisingly showy. 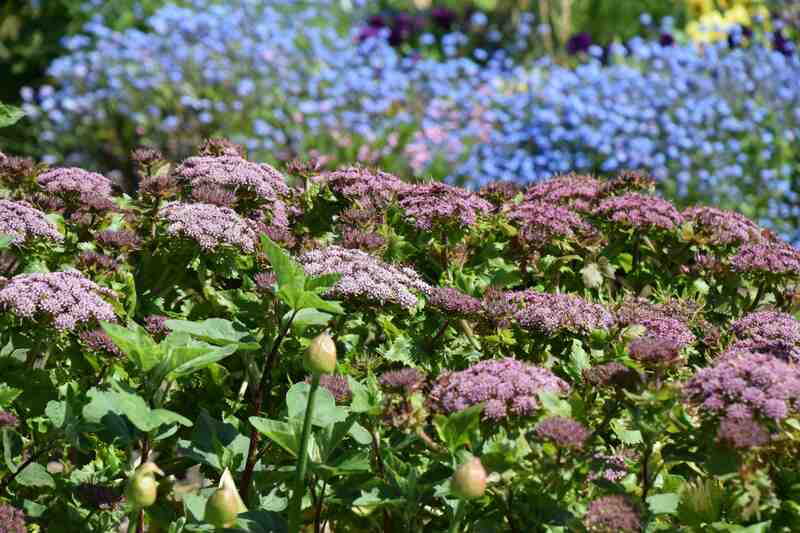 The umbels of blooms each have purple bracts (a la astrantia) that reinforce the display and make the plant showy as well as unusual. Being native to Madeira you would not expect this to be very frost tolerant but it, and the seedlings still in cells, were not harmed by the cold of this past winter. It was not exceptionally chilly but the soil is heavy and we had a lot of frosty nights, with the last about two weeks ago. I doubt it would take lower than -5c for long but nights down to that would seem not to pose a problem. The flowers have just started to open and should last for many weeks. Then I will be collecting seeds because I don’t want to be without this one! * Gigantism is where familiar genera, when isolated from the rest of the genus on islands surrounded by water or by land that isolates them through unsuitable conditions, have evolved into large, often monocarpic forms – see echiums in the Canaries or the triumphantly beautiful Argyroxiphium sandwicense in Hawaii. Now this is a winner do you think I could get seed easily enough ? Just looked at Plant World they don’t have it ….